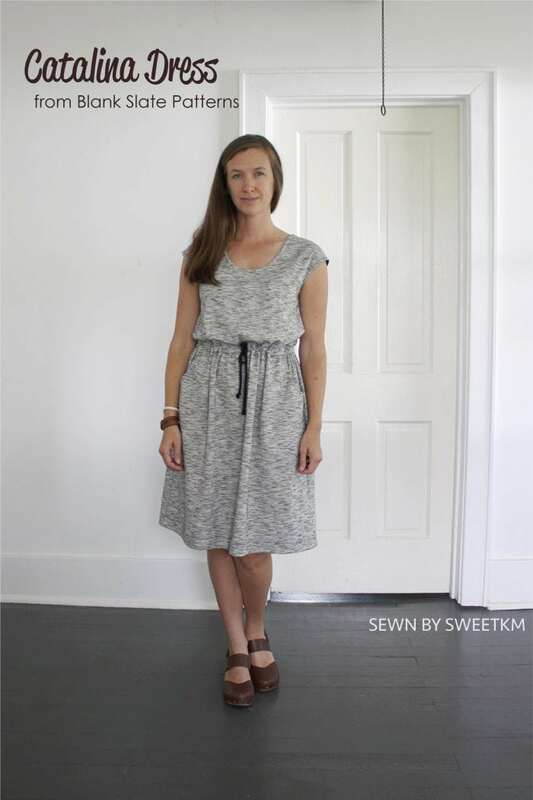 Hi, Kristi here from SweetKM with the Catalina Dress. 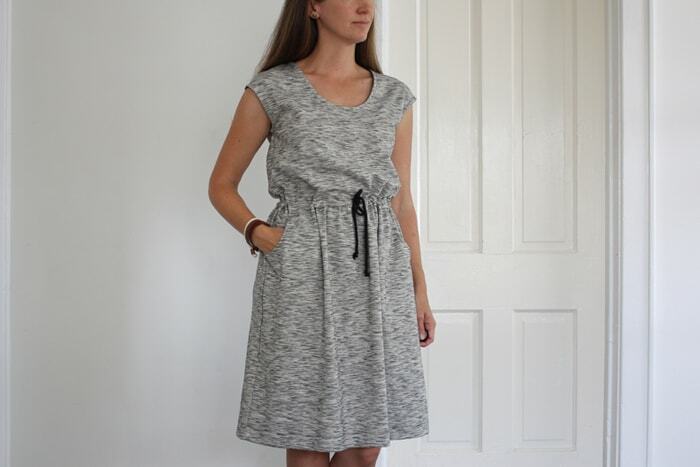 I made this dress in early June before school was out for the summer. I wish I had kept track of how many times I’ve worn it, because it is definitely one of my most worn summer dresses so far. 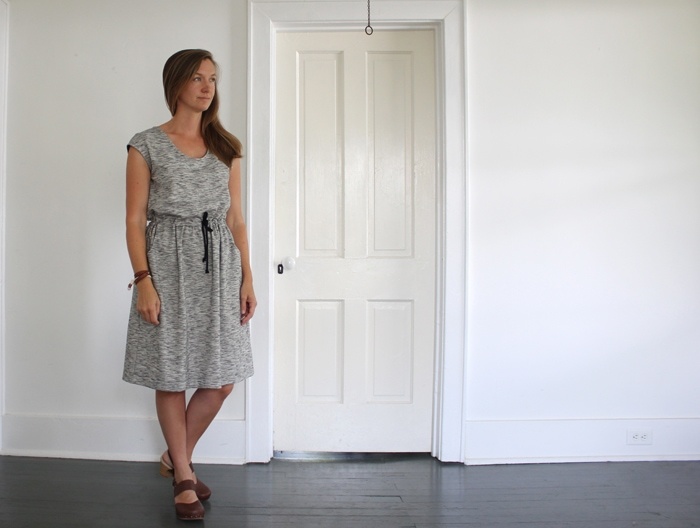 The Catalina Dress checks all the boxes for wearability. 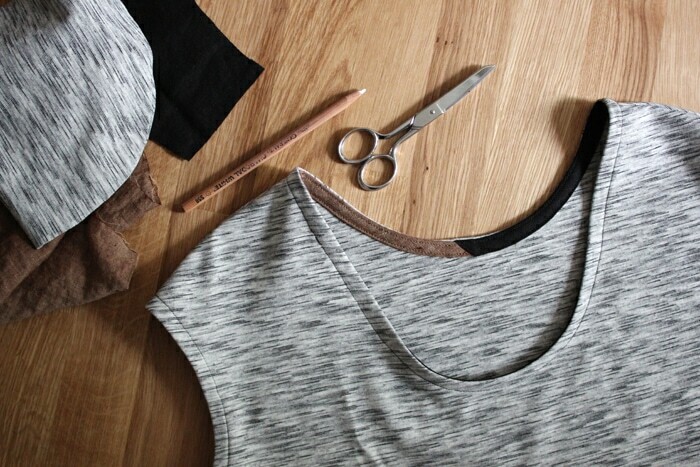 It’s sleeveless for hot weather, but covered enough to be appropriate in any situation. 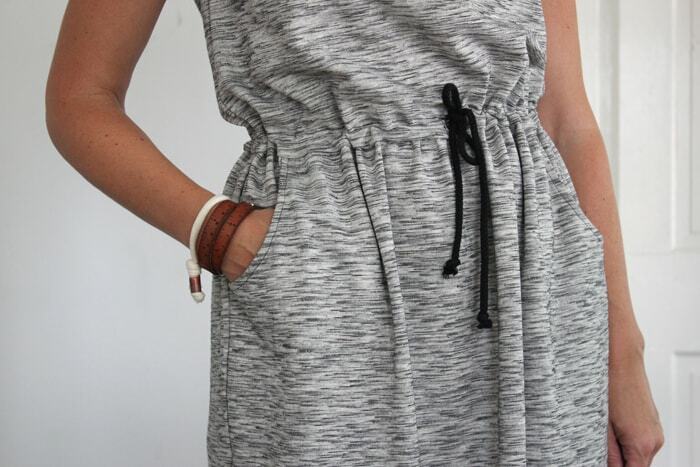 It’s got an adjustable drawstring waist, and most importantly, pockets. 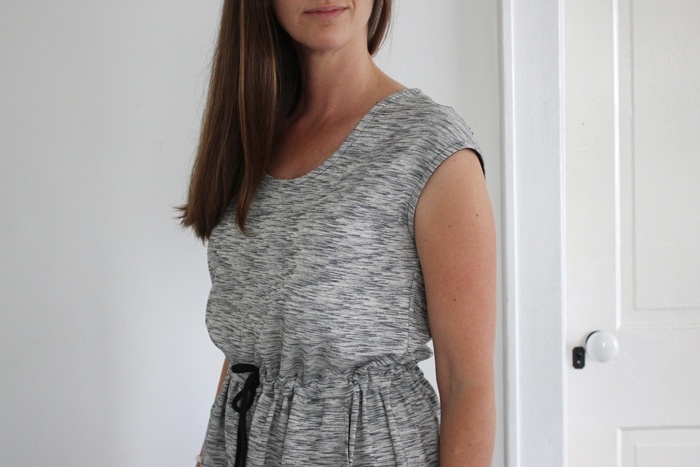 I made mine with black and white variegated ponte knit from Joann Fabrics. The fabric is indestructible, and wrinkle resistant, making it perfect for summer travels where iron availability may be uncertain. 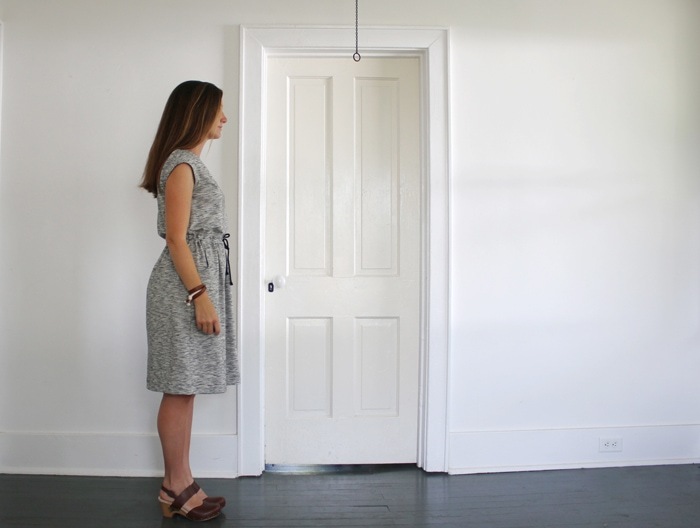 I can stuff this dress into a suitcase, and wear it again without a hint of its mishandling. I cut my Catalina Dress based on my bust size. I usually grade to a larger size at the hips, but the skirt gathers are generous enough to accommodate the difference. My dress is in a fairly neutral fabric so I can easily switch up the shoes and jewelry for different occasions. I couldn’t resist using my favorite mismatched bias binding technique at the neckline. I don’t alway like pockets in knit fabric, they can stretch out of shape so easily. This ponte is a very stable knit, and I made the hidden part of the pocket bag in a linen woven cut on the bias for a bit more stability. The drawstring is a simple black cord. 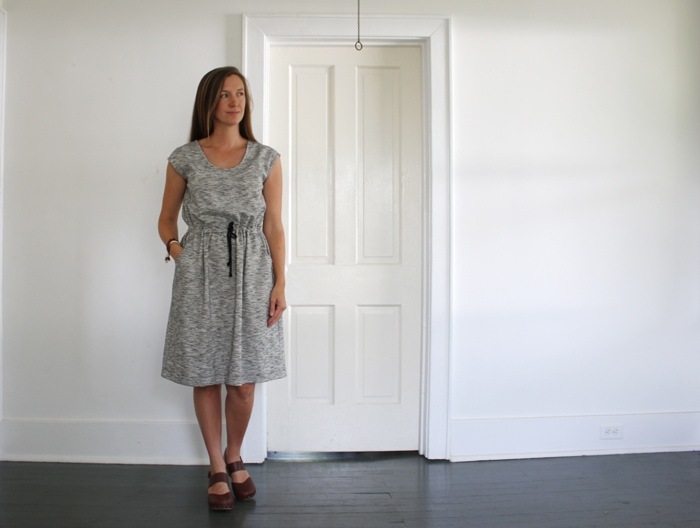 Now that I’ve worn this Catalina Dress on repeat all summer, I’m wishing I had made a few more!